The views and clicks on your landing pages, are what pushes visitors to convert. When you Create pages they rarely lead to traffic unless you deploy the right tactics and strategies to win attention. 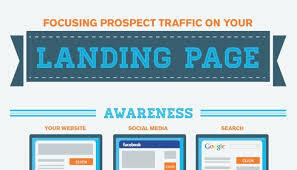 Landing Page traffic can be acquired through buying, borrowing or building. Buying traffic is the most targeted form of traffic. Google, Facebook, and Twitter have increased in worth as a result of selling advertising that drives traffic, sales and leads. The advertisements are popular as they target demographic information companies have on their users. The advertisements work well resulting in more sales. That will bring targeted users to a website or landing page. Social media sites can create advertisements, find the right audiences and track the effectiveness of the advertisements. Different networks have different pros and cons so a test is crucial to find the best one for your particular business. Sponsorship's could also boost a landing page traffic. Individuals and organizations can request sponsors while others can find contact information and offer specific sponsorship opportunities. You can approach a blog to have links that redirect to your site, podcasts can sell a read on their show and events could offer sponsorship. 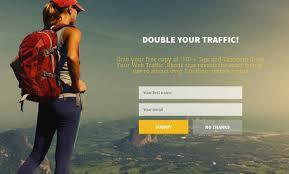 Avoid buying traffic from online traffic services. This involves collaborating with people, businesses, organizations or publications that have web traffic. Borrowing traffic needs the most work with no shortcuts. Traffic may result from your association of your brand with another strong brand, individual or company. You can achieve through guest blogging. write a blog post for another person as well as co-hosted webinars. Find a friend or expert in your particular field and co-host with them on a topic of mutual interest to their audience and yours. Requesting reviews; this is where you could reach out to an organization, publication or person with an audience that you respect and having them review a free sample of your product or service. It is an effective way to get more eyes on your brand by borrowing traffic with an audience. Participation in social media interactions with your accounts can prove beneficial for borrowing traffic. This involves the creation of unique relevant content and patiently waiting for it to generate internet traffic. If the content is good for the website then landing can be discovered by internet users over time. There are various ways of marketing content. You should have good content as people tend to share these.Search engines also prefer to guide traffic towards good content because it builds the reputation of the search engine. There are variations of content you can create and use to market the business e.g blogging, videos, eBooks etc. Search engine optimization should however be appropriately used to make the website and its content valuable and preferred by the audience.